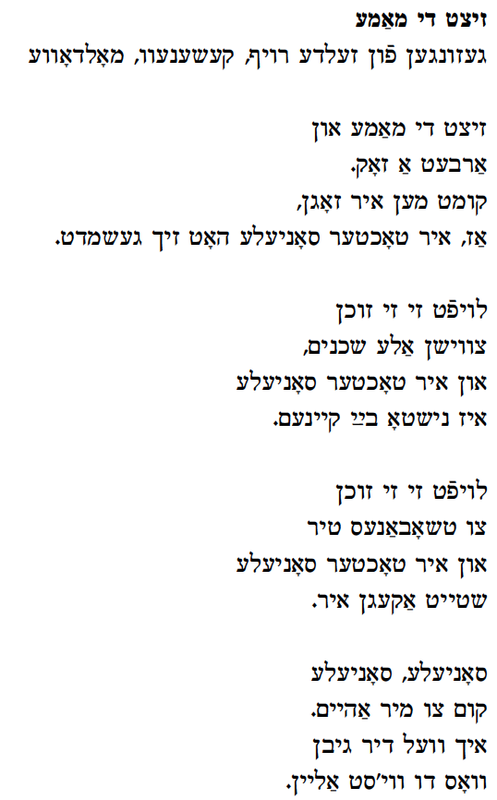 This week’s Yiddish Song of the Week is a performance of the opening verse of Mayn lomp vert farloshn (My Lamp is Being Extinguished), a very old death ballad, by Lifshe Schaechter-Widman (LSW). The recording was made as part of the Leybl Kahn recordings of LSW, done in New York City in 1954. Schaechter-Widman was born and raised in Zvinyetchke, Bukovina; for more information on the singer, see previous posts. The only other recording I know of this ballad is to be found on accompanying DVD to the publication Unser Rebbe, unser Stalin by Elvira Grozinger and Susi Hudak-Lazic, Harrassowitz Verlag, Wiesbaden, 2008. This important publication consists of the field recordings of the Soviet ethnomusicologists Sofia Magid and, to a lesser degree, of Moishe Beregovski. The transcription of the words to the song (which is fragmentary), the transcribed melody and comments on text and melody can be found on pages 226 – 230. But a fuller textual transcription done by Beregovski or someone in his research team can be found on pages 539-540. The singers were a blind mother and daughter, Rivke Verbitskeya, 52 and Esther Verbitskeya 25. Both were members of a Soviet worker’s cooperative (ARTEL) for the blind in Shpole, Ukraine, recorded by Beregovski in 1940 in Kiev (let’s call it the “Kiev Variant”). Their performance, singing the melody together with no harmony, is fascinating. It’s not the kind of song one would usually sing as a duet, but considering that they are blind and have probably sung it together many times to accompany their work or pass the time, it is understandable. Another variant can be found in Beregovski’s collection and in S. Z. Pipe’s collection (with music!) of Galician folksongs edited by Dov and Meir Noy, Yidishe folkslider fun Galitsye (Volume 2, Folklore Research Center Studies, Jerusalem, 1971). p. 101 and notes on variants p. 29 (“Galicia Variant”). Pipe’s collected songs always seem to be the closest to LSW’s Yiddish folksongs from Bukovina, and I think one can safely say that central/eastern Galicia and Bukovina could be considered the same territory in terms of folklore (no great surprise really, since they were both Austria-Hungary before the first World War). So we have the music to three different variants; a rare treat for an old ballad. Musically the Galicia Variant connects the Kiev Variant to the Bukovina one. Schaechter-Widman sings it slower and more emotionally (as is her traditional style) than the Verbitskeyas in Kiev and slower than is indicated in Pipe’s collection. 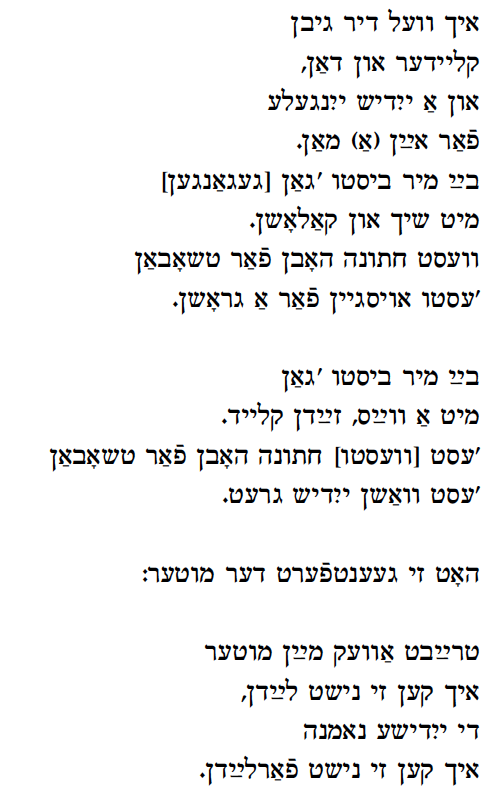 But textually speaking, the richest material on this song can be found in Noyekh Prilutski’s 2nd volume of Yidishe folkslider, Warsaw, 1913, pages 26 – 41, with many long variants from Warsaw and other Polish towns – Tomashov, Srotsk. The song, in classic ballad form, is aways a dialogue usually between the dying person and the angel of death. The line “mayn lomp vert farloshn” or “der lomp vert farloshn” appears in all of them except one, though it doesn’t always start the ballad. How old is this ballad? As I might have written before, the only way we can judge this is to look at the variants and see where they were recorded, and in this case, the area covered of where the song was performed is very large – from the Vilna area, to Warsaw to Ukraine , Galilcia and Bukovina. So, as regards the ballad’s age I would say early 19th century, late 18th century. un ikh miz shoyn geyn fin der velt. Ver vet rakhmunes hubn af mayne kleyne kinderlekh? Un ver vet zey hitn fin der kelt? and I must already leave this world. Who will have pity on my small little children? Who will protect them from the cold?